Summary: It was just supposed to be a simple hookup - Finley is a model trying to shed her good-girl image to land some higher-paying jobs so that she can achieve her real dreams. Eddie is new to the modeling world, running away from... something. They meet at a party and enjoy each other's company for a night. But their chemistry is undeniable, and as they keep running into each other at various jobs and around their apartment building, they stop trying to fight the inevitable feelings that arise between them. But Eddie is hiding a rather major secret, and Finley definitely has a penchant for taking care of others and not putting herself first. They both find that going for what you want - especially if part of what you want is love - is not as easy as it seems. Thoughts: I enjoyed this more than I thought I would - when the official press description mentions modeling and describes one of the main characters as "shallow" and "predictable," it's easy to expect a vapid sort of love story. But it ended up being the opposite of shallow and predictable, really, and it's not merely a love story. Or, well... it's definitely a love story, but their romance is only one of the many love stories present in this novel, and I think that's the best part. Don't get me wrong - I love the dynamic between Fin and Eddie, and their moments are at times hilarious, at times heartfelt, at times dramatic, but this was also a book about love for your friends, your family, your hobbies, and especially important, for yourself, to take the steps that are necessary to make sure that YOU are living your best life on your own terms. 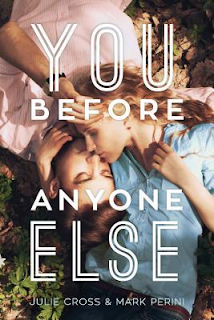 The title of the novel sounds like it could be referring to putting the boy/girl you love before everyone else, but in fact, I suspect the "you" in the title means YOU - putting yourself before anyone else. And that's what I really, really liked about this book.